With the introduction of Ciaz 2016 on the Philippines turf, the C-segment sedan has inculcated the sense of insecurity among existing players in the market. However, the brand is positive to turn down the competition at once with the new Ciaz that carries every trick off its sleeve, which takes it to rise to the top. Despite its sophisticated looks, uber-cool and well-crafted interiors, it won’t be a walk in the park for the Japanese automaker as it stands against the likes of Toyota Vios, which joins the automotive segment from the world’s most renowned and reliable brand, Toyota’s arsenal. The fight is definitely on as both these cars hold potential to outclass one another in some or the other aspect. Following is the descriptive comparison amongst the two that’ll take to a conclusion of a better choice. On the outside, both the sedans have their own splendor. 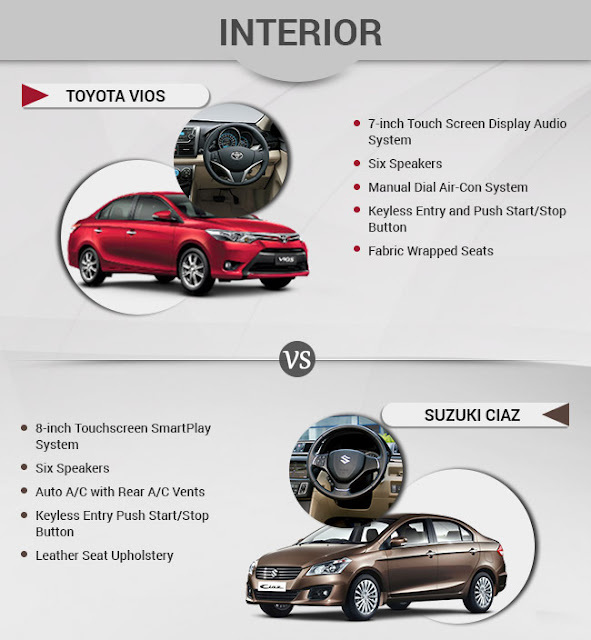 For the one who wish to own an aggressive drive, then Vios will be a better option to opt for while the sophisticated styling of Ciaz will attract the executive class. 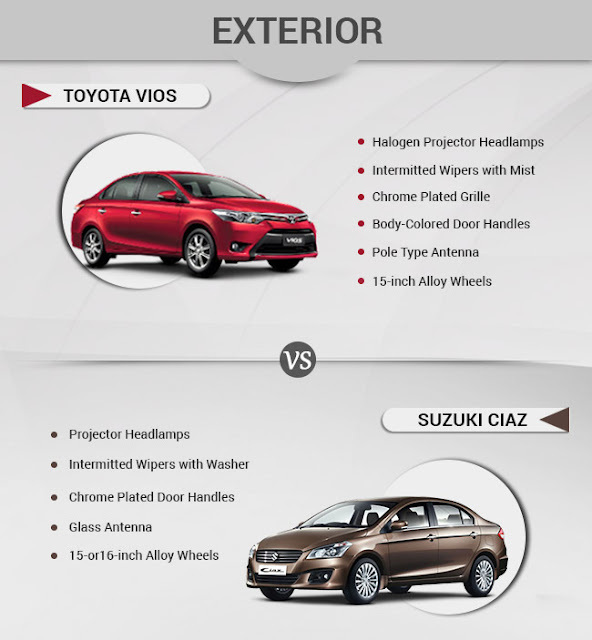 Vios adheres a dual chrome plated slat at the front along with the sharp-edged projector headlamps while the Ciaz has a more subtle and well-organized four chrome-plated slats at the front with projector headlamps. 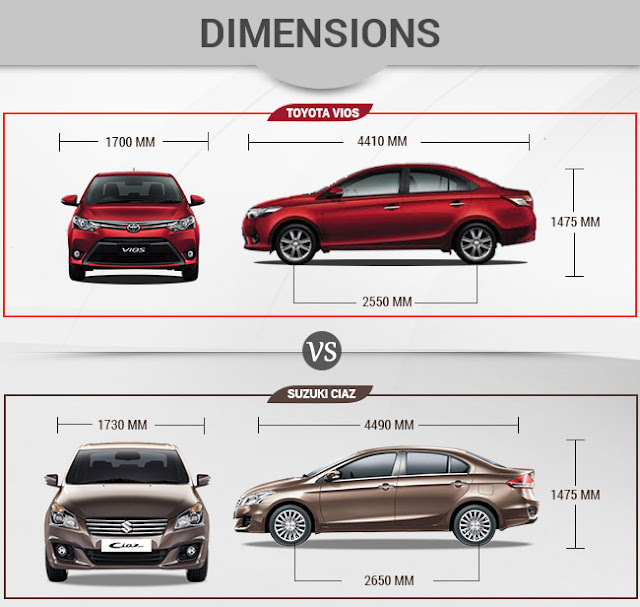 Talking about the wheelbase, Ciaz takes the lead in this section as it comes with 100 ticks more than the new Vios, making it more spacious from inside and also its side profile looks longer as compared to Vios. Vios runs on 15-inch alloy wheels while the new Ciaz comes with an option of 15 as well as 16-inch alloys. Stepping inside the cabin of Ciaz gives you a plush and symmetric feel as every necessary control is placed ergonomically, keeping in mind the position of the driver so that he doesn’t have to enter in an agonizing position to operate. The black interior looks gracious with the silver accents on the dash and the door panels. On the entertainment front, it has a large 8-inch touchscreen SmartPlay infotainment system that serves basis for the audio and navigation system. The integrated system also comes with wireless connectivity in addition to pre-loaded apps like YouTube, Facebook, Waze, and Gmail. On the other side of the court is Toyota Vios, which has an exclusive 7-inch touchscreen display audio system with 6 speakers in the latest variant introduced at the recently wrapped up MIAS 2016. Apart from this, it has features like manual air conditioning system, key less entry, push start/stop button and the fabric wrapped seats, which are cushioned in an optimal fashion, providing utmost comfort to occupants. In terms of power, Vios is the clear winner and if you are one from the flock for whom this aspect comes with the highest priority, then surely this is for the taking. The Toyota’s reliable engine is another good reason for you to lean towards this C-segment sedan. 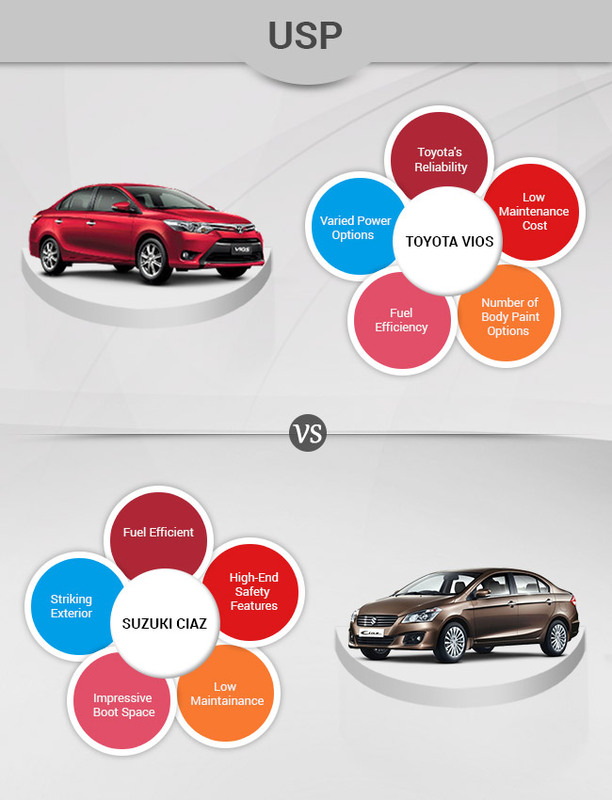 However, you can’t ignore the Suzuki’s excellence that comes incorporated with Ciaz. Although, it churns out less power as compared to the aforementioned sedan but is certainly a value for money buy for the executive class. Talking about the numbers, Vios has a 1.5-litre VVT-i DOHC four-cylinder engine that’s potent to yield 108 PS of power at 6000 rpm and 142 Nm of torque at 4200 rpm. While Ciaz’s potent and economical 1.4-litre DOHC engine is good enough for 92 PS of total power at 6000 rpm and 130 Nm of peak torque at 4000 rpm. If you are a power fanatic, then clearly Vios should be your pick and if you care about efficiency over power then Ciaz comes in as a handy choice. The ball is in your court and it’s solely up to you on which factors you need to evaluate the car. We advise our car finance customers to test drive cars back to back so they can have the best feel in the differences of the cars they are looking at! Vios is number 1 in PH market for very good reason, I am a suzuki fan, owned 2 including new Ertiga, but to be honest Ciaz will have to offer more to compete Vios. sir, how's the maintenance ng suzuki cars in terms of cost, availability and durability ng parts? Hello! If I may answer, it's actually very costly because the parts are not easy to find. In most cases, you need to wait for the CASA to order directly from the main office for Suzuki parts (they are shipped from abroad via Batangas port). But at least the original parts are very durable, it will take years (beyond the usual 3 years) before they finally break down unless (except for accidents of course). I have a Suzuki Alto since 2009. One week seems fair enough; some authorized repair centers take two weeks or longer to attend to car repairs. 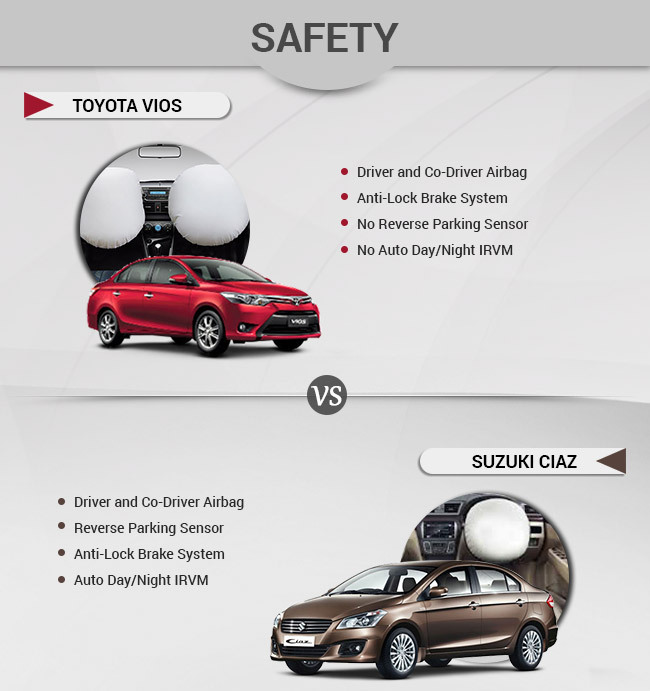 i will choose ciaz. i have already vios high in 2016 model. my problem is very kalas sa gasolina. Yung vios ang ma kalas Ms. Cassey? Paano naman ang air-con? 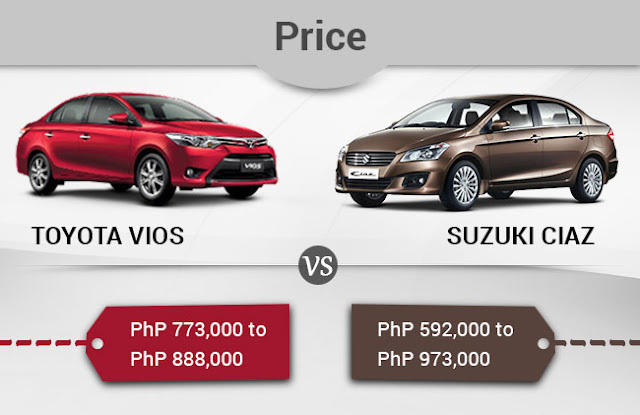 Reliable ba ang Ciaz kagaya ng sa Nissan? 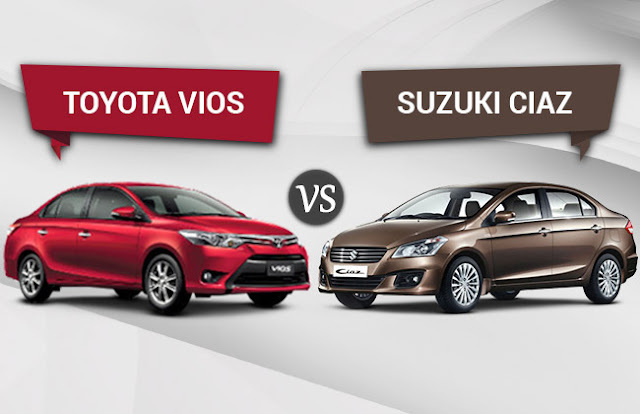 As for the KM/L, how does Ciaz fare against Vios? does ciaz fare enough.though one letdown of ciaz or suzuki is the price of the spare parts, but considering that the ciaz is fuel efficient..the cost saving on the operating cost (fuel) will compensate on the maintenace cost (spare parts price)...now with ciaz 1.4 vs vios 1.3 e with almost same price point...is ciaz the best value for the money? Have you tried racing the two cars? 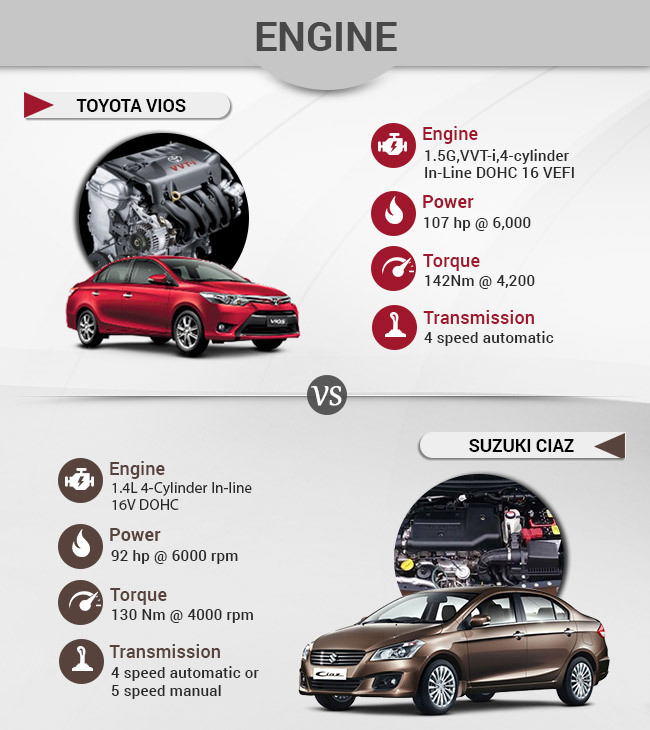 107BHP of Vios vs. 92BHP of Ciaz is just a small difference in power. How fast does the Vios accelerate from 0-60mph compared to Ciaz? How about maximum sustained speeds? which has a higher top speed? This comparative test appears to be incomplete. Mga boss kukuha pa ako car next week nag aalangan ako anu mas maganda.. chevy SAIL?Toyota Vios or The SUzuki Ciaz na ok na ok sana ang mga specs same ng sa vios kaso magka iba sila sa price ng monthly..medyo mas mura ang suzuki eh mga 6k masesave ko..PLEASE DO HELP me..kng sa casa ba mga parts bibilhin, we know kng brand new cgro tatagal pa 2 to 3 years bago mag hanap yn ng mga sira2x i dont know kng MAJOr na agad pero di ba mahirap mag hanap pyesa?and d ba mahal?kaya ba sa bulsa?my friend told me mas mdali dw hanapan vios which is already known na talaga toyota. pero suzuki? Tama yung friend mo. Although mga ilang taon pa bago mangailangan ng replacement parts, isang factor na yun para mag-decide. Not unless bibili ulit ng kapalit after 3 years or so.